One of the reasons why I was eager to ditch my “old” (barely over two years) Sony Ericsson Xperia X10 smartphone is that its battery started to misbehave. Or at least I assumed it was the battery: under heavy load (e.g., recording video) the phone shut down prematurely. I bought an off-market replacement battery that seemed to solve the problem for a while but eventually that battery, too, started to show the same symptoms. What happened was astonishing. Previously, the longest time I was able to keep this phone running was a tad over two days. But now? A record FIVE days and 24 minutes. Frankly, I wouldn’t believe it if I had not seen it with my own eyes. Now I am curious. How long will it take to recharge the phone? Will it give the battery a full charge? Will it still shut down prematurely afterwards if I start recording video? I am also wondering… a voltage drop is not an uncommon symptom for an aging Li-polymer battery. But I should also see diminished battery capacity. 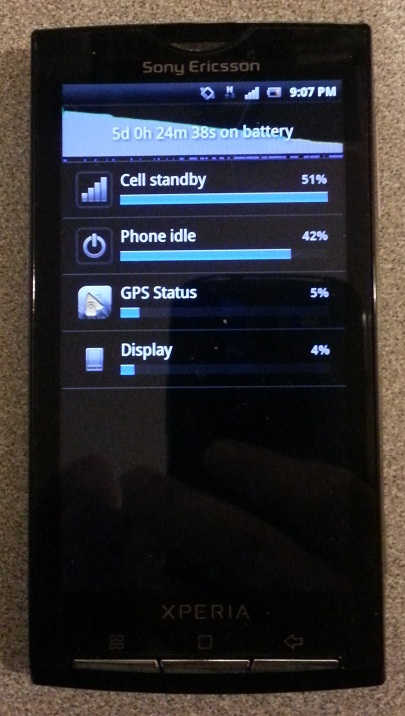 A smartphone running for five days… that does not sound diminished to me! Could it be that the problem is with the phone itself, its power regulating circuitry? How can one tell without purchasing an expensive battery, preferably not from an off-market Hong Kong reseller?